We’ve seen that alcohols are poor substrates for substitution reactions. The main problem is that the hydroxyl group is a strong base, and thus a poor leaving group. In the last post we saw that we can convert alcohols into alkyl halides by adding strong hydrohalic acids (HCl, HBr, HI): the strong acid protonates R-OH to give R-OH2+ (with the better leaving group, H2O) and then substitution by the halide ion can occur. In contrast to alcohols, alkyl halides are GREAT substrates for nucleophilic substitution reactions. Unfortunately this doesn’t always work well. There are two main problems. First of all, on certain secondary alcohols the reaction proceeds through an SN1 pathway, which can lead to rearrangements. Secondly, in so doing, we can end up scrambling any stereocenters that are present. For instance if we start with one enantiomer in the reaction below, we end up with some racemization of the final product. So is there some other way to convert alcohols into good leaving groups that doesn’t have these problems? We all know that hydroxide (HO- ) is a strong base. But have we seen any examples of weak bases with a negative charge on the oxygen? Yes! Sulfuric acid (H2SO4) is a very strong acid (pKa of about -3) and its conjugate acid, -OSO3H , is therefore a weak base. This is due to two key factors – first of all, delocalization of charge on the other oxygens through resonance, and secondly, the inductive effect of those oxygens helping to redistribute the charge. So in a perfect world, if we had some way of easily turning an alcohol (R-OH) into an alkyl hydrogen sulfate (R-OSO3H) then we’d have a nice way of making an alcohol into a good leaving group. So how might this work in practice? Actually it doesn’t work very well! It’s not that –OSO3H is a poor leaving group (it’s a great leaving group). The problem is that many nucleophiles are quite basic (remember – the conjugate base is a better nucleophile) and the OSO3H still has a very acidic proton (that OH group has a pKa of about 2, making it a stronger acid than acetic acid). The bottom line is that if we add a basic nucleophile, an acid base reaction will occur instead of our desired substitution reaction. The nucleophile will be protonated into its conjugate acid (less nucleophilic) and any substitution reactions will be considerably slower. Not ideal! Is there some way around this? Sure! It’s just a matter of replacing that OH group on the sulfur by some kind of relatively inert organic group (R group) that doesn’t have an acidic proton. 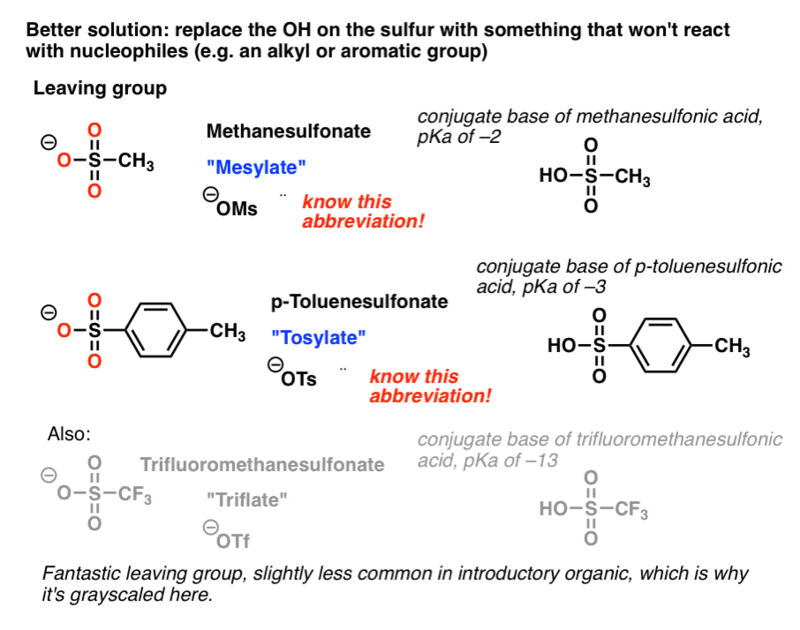 If we swap in a methyl group (CH3) our leaving group would be –OSO2CH3, or “methanesulfonate” (commonly called, “mesylate” and abbreviated OMs. This has all the advantages of a great leaving group without the drawback of an acidic proton to react with nucleophiles. Another popular option is using the conjugate base of p-toluenesulfonic acid, (“p-toluenesulfonate”) commonly called “tosylate” and abbreviated OTs. These groups have essentially identical leaving group ability and for our purposes are interchangeable. Some textbooks tend to use Ts more, others use Ms. It doesn’t really matter for us at this stage: they both work. How Do We Make Mesylates And Tosylates From Alcohols? So how can we apply this? If we have an alcohol, how do we turn that hydroxyl into a tosyl or mesyl group? It’s relatively straightforward actually. We use “mesyl chloride” (MsCl) or “tosyl chloride” (TsCl), and the neutral alcohol performs a substitution reaction on sulfur, leading to formation of O-S and breakage of S-Cl. 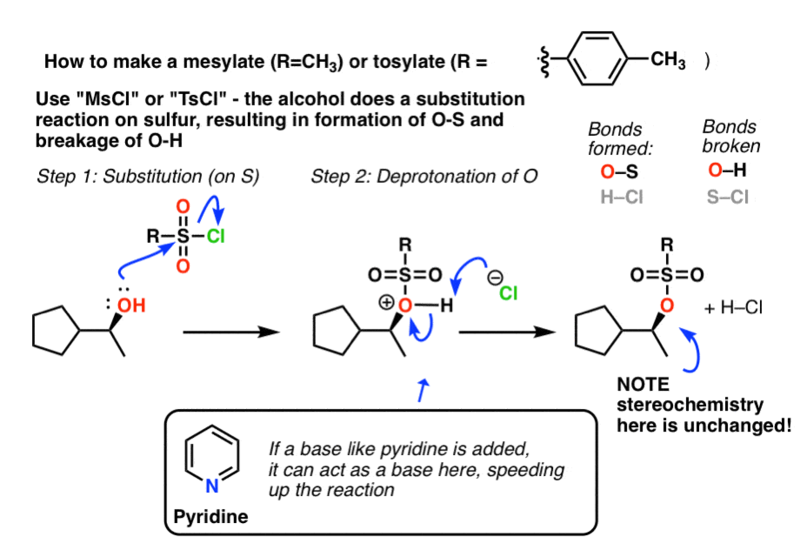 Then, deprotonation of the charged alcohol leads to the neutral mesylate or tosylate. Note that the stereochemistry is completely unchanged here (unlike if we had used H-Cl, for example). Watch out for this – stereochemistry is often tested on exams! Let’s finish up by seeing some specific examples of Ts and Ms in action. 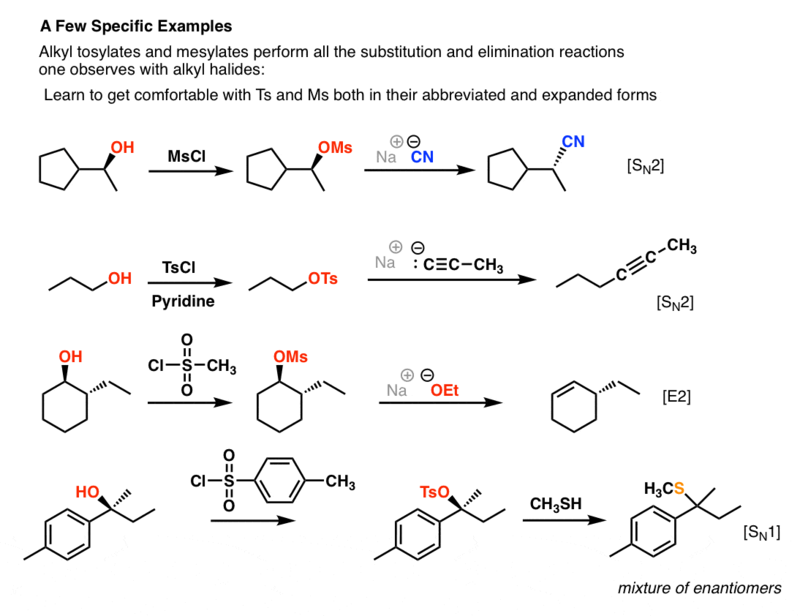 As they contain a good leaving group, alkyl tosylates or mesylates can perform all of the substitution and elimination reactions of alkyl halides. A few examples are shown below. Get familiar with MsCl and TsCl in both their abbreviated and expanded (i.e. “drawn-out”) forms. 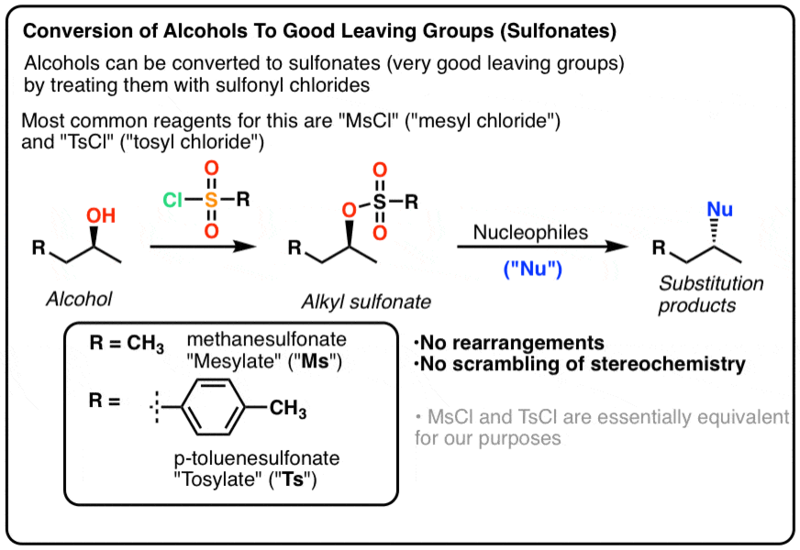 In the last two posts we’ve seen how useful it is to be able to convert alcohols to good leaving groups. In our next post we’ll cover one last method to do this that involves some new reagents, PBr3 (including other phosphorus halides) and SOCl2. Sulfonate formation actually proceeds pretty much exclusively through a sulfene state, not via a charged intermediate. This paper has a pretty good overview (page 137 onwards discusses sulfenes, $$). My understanding is that pyridine/DMAP acts as both base and nucleophile. The base character generate the sulfene, which is then attacked by a second molecule of pyridine/DMAP to form the charged intermediate you’re referring to (this step also deprotonates the first unit of pyridine/DMAP). The nature of the reaction could change depending on the type of sulfonyl chloride. For example, t-burylsulfonyl chloride can’t form the sulfene, and must react via either SN1 or SN2. It’s also an incredibly poor electrophile, to the point where it does not react with amines under standard conditions, necessitating a weird oxidation from the sulfinamide to make t-butylsulfonamide. That’s interesting (and weird), because TsCl or benzenesulfonyl chloride don’t have any problem reacting with amines AFAIK. My friend Jeff who did some research proposals on sulfenes is of the opinion that DMAP might be a strong enough base to form the sulfene, whereas pyridine is not. Err… sulfonamide formation is via a sulfene intermediate, not an SN1 or SN2 mechanism (SN2 mechs, like the one depicted, aren’t charged). Is the presence of some other groups (e.g. aldehyde) a problem for this reaction? Will aldehyde react with OMsCl? On paper, no, nothing bad should happen. In practice, aldehydes are susceptible to air oxidation (among other side reactions) and are often kept in protected form until needed. Truly great post! One small thing, though: in the text there appears “trifluoromethylsulfonic acid”, which I thing should read “trifluoromethanesulfonic acid”, as it actually does in the picture below the paragraph. Well ,the last two examples that you gave in your arcticle……is there any chance that they’ll not follow the mentioned mechanism…..like in the 3rd example instead of E2, can it be Sn2..?? I have one problem, my compound is open sugar molecule, I have to tosylate selectively the primary alcohol. I have try the pyridine as a base, but I am not able to get the product. Please give your suggestion. I would selectively tritylate the primary alcohol with trityl chloride, protect the other alcohols with acetic anhydride or TBS, remove the trityl group with trichloroacetic acid, then convert the primary alcohol into a tosylate with TsCl. Hi, thank you for nice explanations! Got a question… Is it will be a problem for mesilation of free OH, if i have another hydroxyl in the compound already protected with trityl group? I just need farther convert mesyl into azide, since it well leaving group. And need to keep other primary OH protected during this pricedure. Any advise please! Thank you! No, that should be easy. Mesylation will not interfere with the trityl group. You’re just adding MsCl or Ms2O with NEt3. Just a question. If there are amine or thiol groups on your alcohol compound, do MsCl and TsCl attack them instead of alcohol? Thiols and amines (but particularly amines) can react with MsCl and TsCl. For that reason, when one is trying to synthesize a given molecule it is important to only have one reactive functional group present and have the others deactivated through protection. Trying to selectively tosylate or mesylate a molecule that has multiple unprotected functional groups is a recipe for a lot of wasted time. Reaction of TsCl with alcohols and amines. Would you expect to get same degree of tosylation and leaving group? Which one is easy to work with alcohols or amines? I’m not completely sure about the question being asked. The answer to that is, the amine, by a large margin because amines are many orders of magnitude more nucleophilic. It is relatively difficult to remove a Ts group from nitrogen, therefore it is not recommended as a protecting group. If you could clarify your question then I could try to answer it differently. Not enough information. Need a structure. Hi James, Thanks for reply. I was going through the above comments and i have one query here that why trityl chloride is used for selective protection of primary hydroxyl group in glucosides? Hi Sarah, it’s because the trityl group is just ridiculously huge. Getting it on to a secondary alcohol would come with a severe steric penalty. Great article regarding alcohol protective groups! I read it with high interest because I’m performing protection of alcohols followed by a substitution reaction. The molecule I’m working on consists of a secondary acohol and a secondary amide. The idea is to protect the alcohol as OMs or OTs to make it a better leaving group which would then react with the amide group and close the structure (cyclization) to form a 2,5-substituted pyrrolidine. Am I thinking correctly? Following your guide the NH of the amide should be nucleophilic enough for the cyclisation and OTs or OMs would easy leave. I’m using pyridine to speed up the reaction too. Where R is usually a Ph group or substituted aromatic ring. I would imagine that reaction would work quite well. Mesylate first, then you might find it will snap shut without additional work. If not, then deprotonate the amide with strong base. I have 1,5- diol, want to protect with mesyl chloride at once. What I should do? It’s unclear to me if you want to form the mono- or di- mesylated product. Have you searched the literature? How about treating phenols and hydroquinone with MsCl or TsCl? Can you please suggest? It can be done. What’s your aim? I want to try Ph-OH with TsO-Alkyl with base. Alkylation of phenol with an alkyl tosylate should work fine, depending on the alkyl group. Primary will be best of course. Sir i also worked in carbohydrate chemistry, but i have suffered one problem, the problem is when i want to try tosylation of prymary alcohol in open sugar in presence Py & TsCl, the reaction not perform. But, in cyclic sugar, 6 th prymary alcohol Tosylation in presence Py & TsCl, also Perform, Please sir help me about your kind guidance, How to do this prymary alcohol tosylation in presence secondary alcohol, where secondary alcohol remain same. But prymary alcohol only react & convert with tosylated product. i shall be highly obliged with you. It’s impossible to answer without more information such as a screenshot. Hi James, this was a great post! Just a question: doesn’t mesylate still contain acidic hydrogen because of the the methyl group? You raise an excellent point. The methyl group of mesylate can be problematic if you’re working with strong bases because it is reasonably acidic. Question. Thank you very much for your post and your endless effort to make organic chemistry readily assessable for people to learn. I have a question. If Its which is a good leaving group is in an acidic environment. Does it need to then be protonated first? Cause I did not see you talk about that in this post. Thank you so much. I hate to say, “it depends” , but it depends. Good leaving groups are weak bases. If the proposed leaving group is already a weak base before deprotonation (e.g. TsO- ) then protonation won’t be necessary. However if the proposed leaving group is not a weak base (e.g HO-) then protonation will make it a much better leaving group.